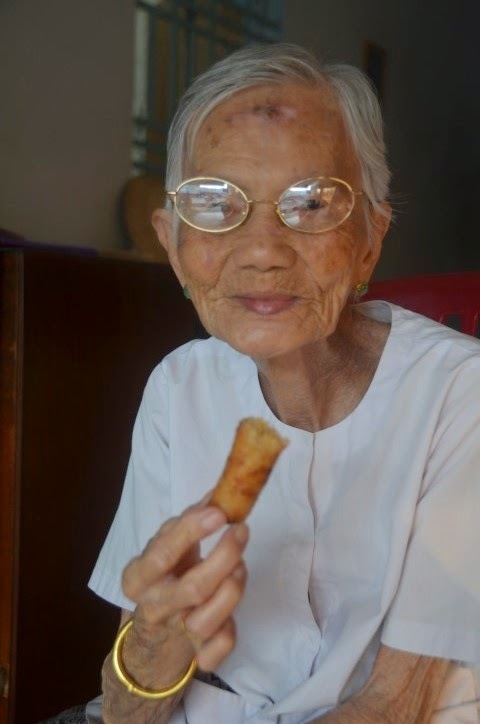 Tua Y (maternal eldest aunt) says she prefers making her cha gio (or egg rolls) using pork, jicama, carrots, and thinly sliced shallots. 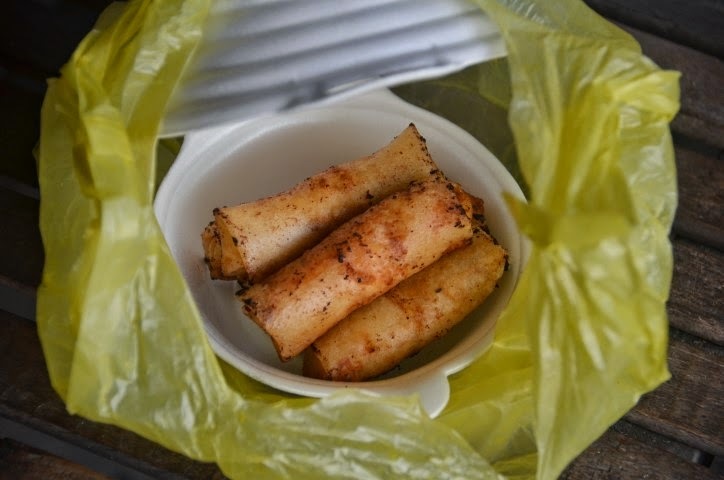 She explains that it is important that most of the ingredients need to be washed and squeezed dry with a cheese cloth so the egg rolls will not be soggy. She tells me many people in Rochester, Minnesota who have eaten them love them so much that they have made special requests for these. She has made over 100 rolls for her son's work annual party and they generally disappear rapidly! On her last day of visiting Vietnam she gave me a list of ingredients that go in these rolls. Here is her way of making these. My cousin Sieu Hui and I made these rolls after we shopped (at the only department store in Soctrang). 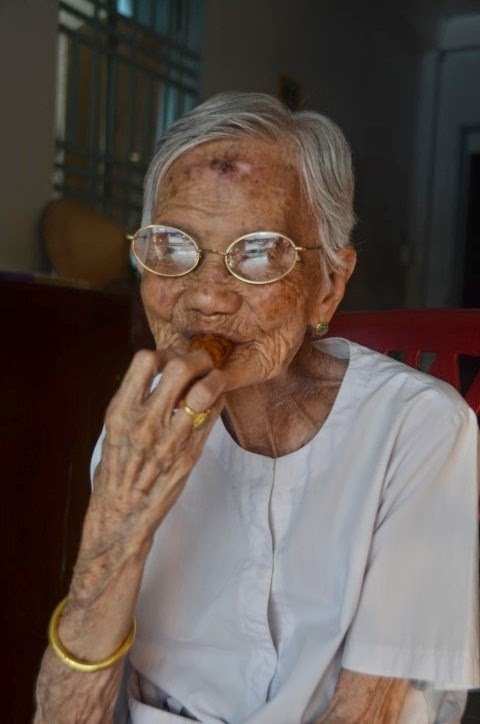 She had a package of bo pia (egg roll skin) left from the previous egg roll experimentation. We decided to make just 30 rolls this time. As the rolls were done cooking they were disappearing fast! Sieu Hui was happy to see that these were a success but realized we need to save some for Ah Ma. She managed to scoop up 5 of them and put them in a container to go. Ah Ma ate 2 of these prior to her dinner and gave us her approval! 1) Grind the pork and shrimp together by pulsing a few times (if not already done). Avoid over grinding. Place these ground items in a large container. 2) Squeeze the jicama, carrot and shallots with your hands to remove and discard the liquid. Place these in the container with the ground pork and shrimp. 4) Mix the ingredients until well blended. Avoid over mixing. 5) Divide the mixture into 30 relatively equal balls. 6) Separate each egg roll skin or sheet by peeling it one by one and put these under a dish, towel or bag to prevent from drying out. Take only one out at a time to roll. 7) Take one ball and place it about 1 1/2 inch from the bottom of the skin. Spread the filling into about 2 1/2 inch length across the skin. Roll from the bottom up as tightly as possible without tearing the skin. Fold in the sides when you get close to the center of the skin. Continue to roll as tightly as you can and smear a little water (using your finger) on the top edge to seal the roll. 8) Fry these rolls in hot oil until golden brown. It will take about 5 to 7 minutes. Avoid over crowding the rolls when frying (as this will cause your oil to cool down making the rolls soggy and oily). *You may make one roll to test to see how it tastes. This way you can adjust the seasoning according to your taste. *You may divide the filling portions out according to your skin. This way you will not have too much left over of either the filling or skin. If you happen to have more filling then you can make patties out of it and make sandwiches with them. *Try not to shred the jicama too fine. *The egg roll skin is made in Vietnam. There is a similar size sold in the Asian stores in the United States but it is square instead of round. You can use these instead. 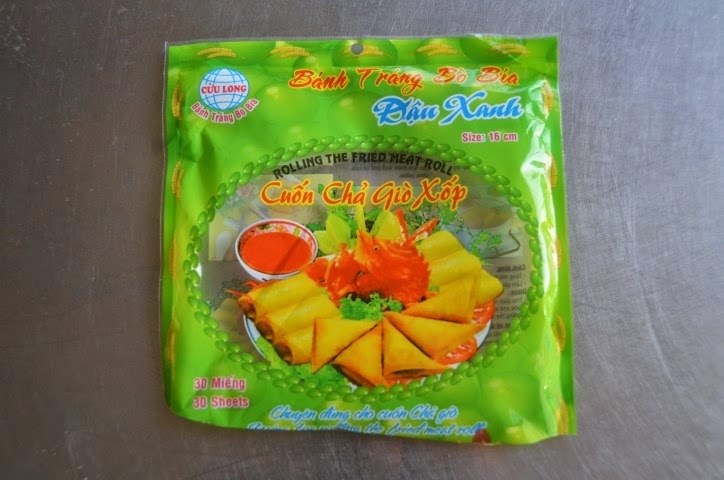 Another option is to use Vietnamese rice papers known as banh trang in Vietnamese. Ah Ma taking a taste test of the egg roll. and telling me they were delicious!